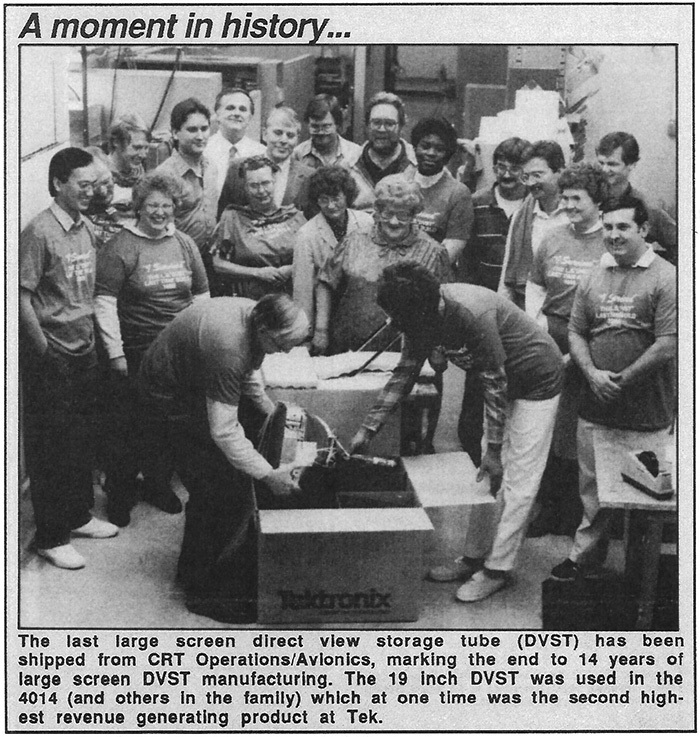 The CRT Operation ran from 1954 until 1996, a total of 42 years of providing significant technology to Tektronix. 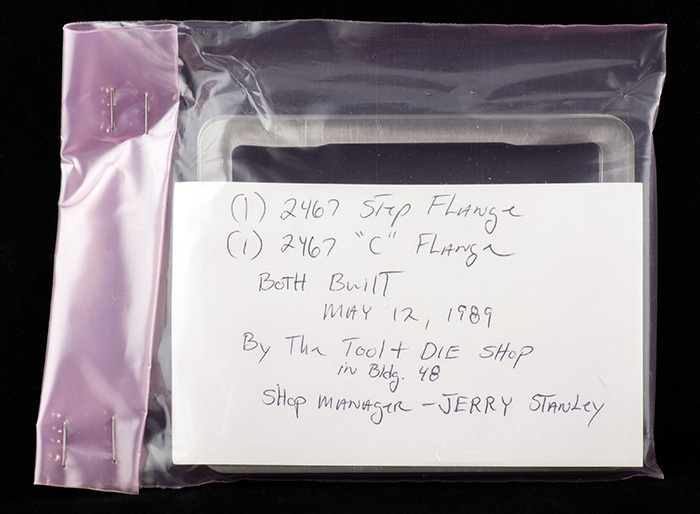 At their 35th anniversary in 1989 the CRT Operation created a time capsule which we are fortunate to have some of the items at the museum. A few of the CRTs were damaged but the vast majority of items give a clear indication of the breadth and depth of the technological innovation that came from this department. The capsule was built by the talented people in the tool and die shop was created from a large bell jar painted blue, placed on top of a custom wood cabinet with a plastic protective cover built over the top. There was an all employee assembly where someone from each department donated an item that was meaningful to their group. Most of the items were to show the technology of the time but a few were just for fun such as the swizzle stick, drinking glass, and EDM parts. In addition, people made predictions about the future, read them during the assembly, and put the written predictions and a video (VHS) inside. 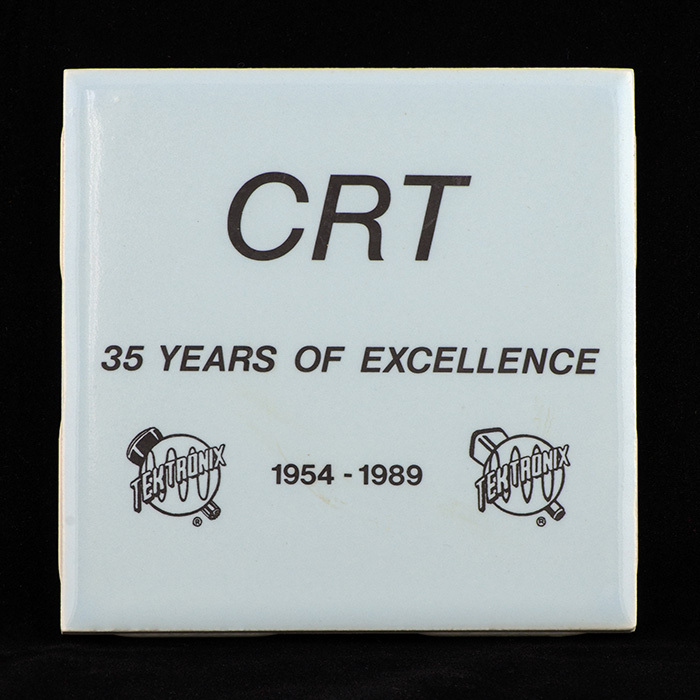 There is more information of the CRT operation on the CRT Manufacturing page which also includes an article on the 35th anniversary celebration. Here are the items from the CRT time capsule. This is a prototype of a 1/2" CRT which was intended for a head mounted display (HMD) application. 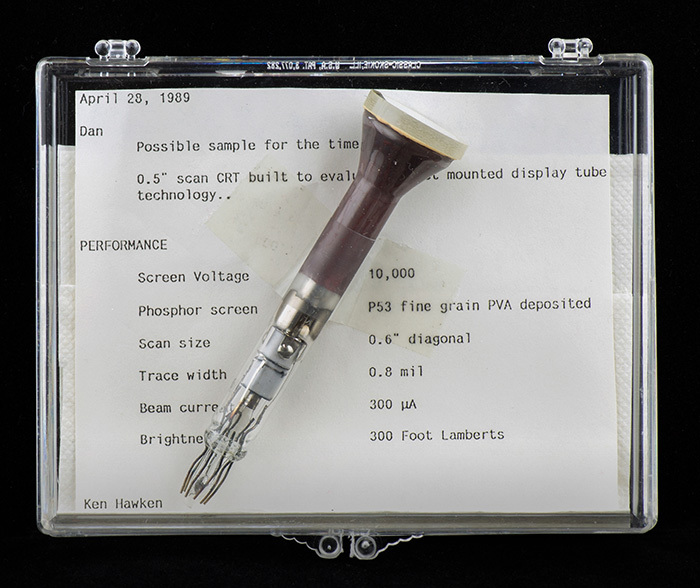 This miniature CRT prototype was designed by Ken Hawken and would be mounted on a helmet or eyeglass assembly. The user might have second thoughts if they knew this device with 10kV accelerating voltage would be mounted a fraction of an inch away from their temple. This CRT was never productized. This is a T541 CRT electron gun assembly used in the Type 541 oscilloscope. The Type 541 was a 30 MHz oscilloscope introduced in 1957 to 1966. This particular gun was from the first batch produced in 1957. This 4.75" mesh is likely an ion collector mounted near the screen in an T5490 CRT. It was very difficult to avoid parallax error in making measurements from the older blown glass CRT bulbs due to the combined thickness of the glass and the scribed plexiglass graticule covers. 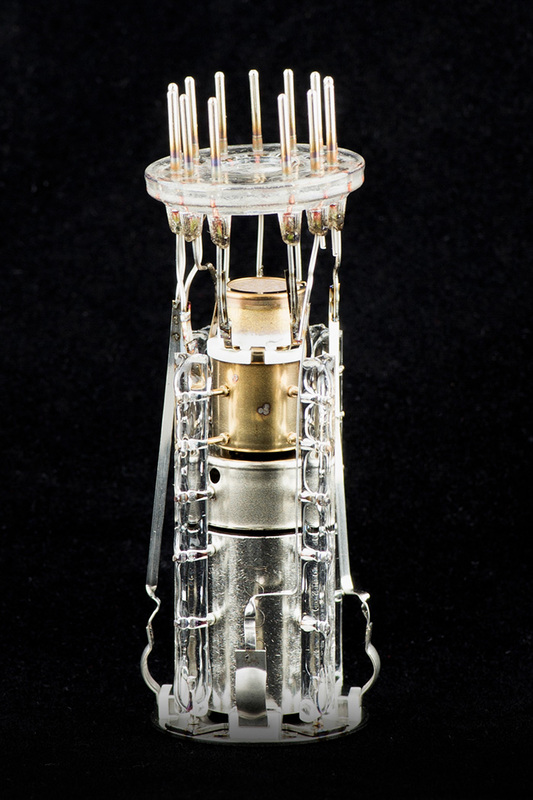 Prior to the introduction of ceramic CRT funnels in 1962, parallax-eliminating internal graticules were deposited on the inside of glass bulb faceplates using photodeposition. 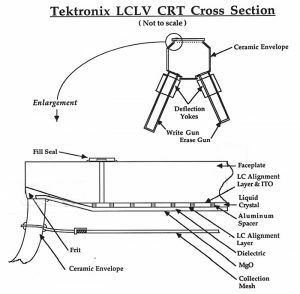 With ceramic funnels Tek used silk screening to create a graticule on the inside of the faceplate in scope CRTs before phosphor deposition and frit attachment of the funnel. A choice of different materials permitted different colored graticules. In addition to the graticule, the picture shows a black border was also applied to hide the tan colored frit seal between the ceramic funnel and the faceplate. The T485 CRT was used in the Type 485 oscilloscope, providing 350 MHz bandwidth. Unfortunately the CRT has been broken but this gives us a view of the remains of the domed scan expansion mesh located at the end of the gun (lower left of center in the photo). It was damaged when the CRT was broken. The scope was produced from 1972 to 1986. Product literature at the time touted the Type 485 oscilloscope as having the “fastest writing speed of any portable scope”. Price was $4200. 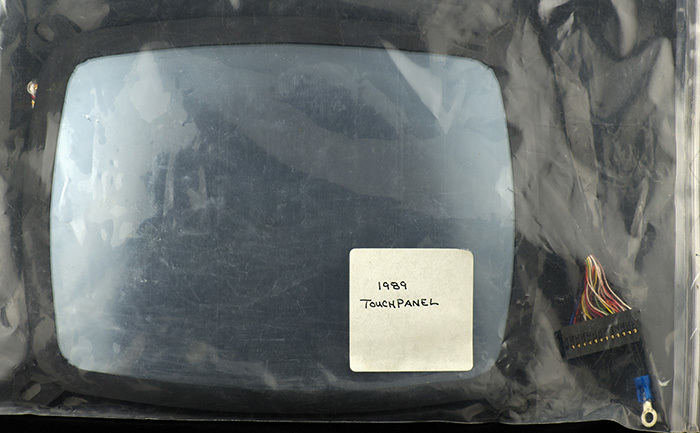 Tek Touch™ panel was a touch input system developed in the mid-1980's at Tektronix when touch interaction was still a novelty. The system consisted of a glass panel designed to overlay a CRT screen and touch control electronics. A key to the technology was a thin film of Indium Tin Oxide (ITO) deposited on the glass overlay. This process took place employing the ITO deposition system in Building 46 that was previously used for large screen storage CRTs. This is a touch panel overlay built in 1989. There are two TekWeek articles that describe the Tek Touch™ panels on the Technologies page. 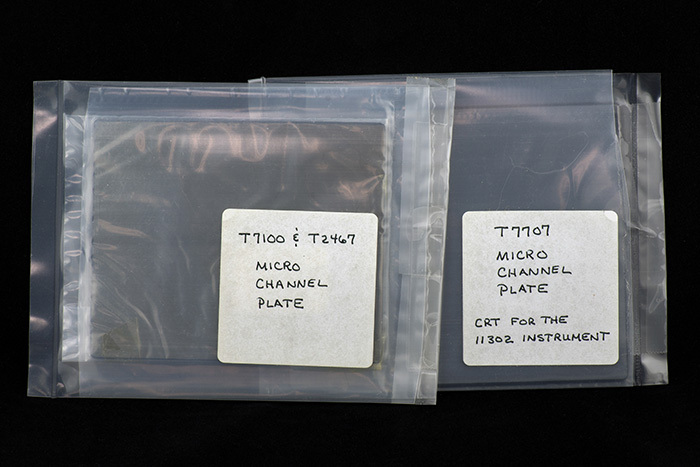 The T2467 CRT flange was the microchannel plate mounting structure for the T2467 CRT. The T2467 was used in the 2467 oscilloscope, introduced in 1987 at a cost of $11,900. These flange steps were made for the 2467 by the building 46/48 tool and die shop. The T4221 CRT was used in the Tektronix Type 422 oscilloscope, a 15 MHz portable dual-trace oscilloscope ideal for field service work. It was a true portable with the possibility of being powered by a wide range of input voltages or with an optional battery back. The 422 was introduced in 1966 at a price of $1400 for the AC-only version. It last appeared in the Tek catalog in 1975. This particular CRT was signed by the manager Lee Ball and the people in the group. It has a written note on the ceramic body indicating it was from a special military build. Unfortunately the neck glass has been broken - we hope this wasn't intended to be a ruggedized version. These are various buttons for CRT events. The 2465 was selected Product of the Year we believe in 1984. Bright Eye™ was the trademarked name for the 2467. We have a 2467B Bright-Eye video on our Video Gallery. The Storage CRT Tour Guide pin has a very stylized T611 CRT. 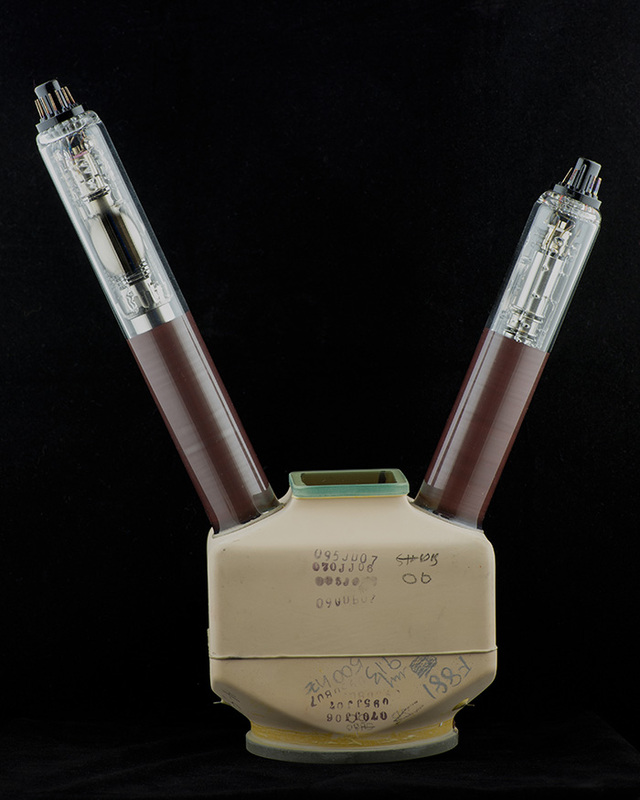 These cathode assemblies appear to be flood gun cathode assemblies used in the storage CRTs Tektronix fabricated in Building 46 and 48. These electron sources provided a broad electron emission to enable storage of an electron beam trace in direct-view storage tubes (DVST). 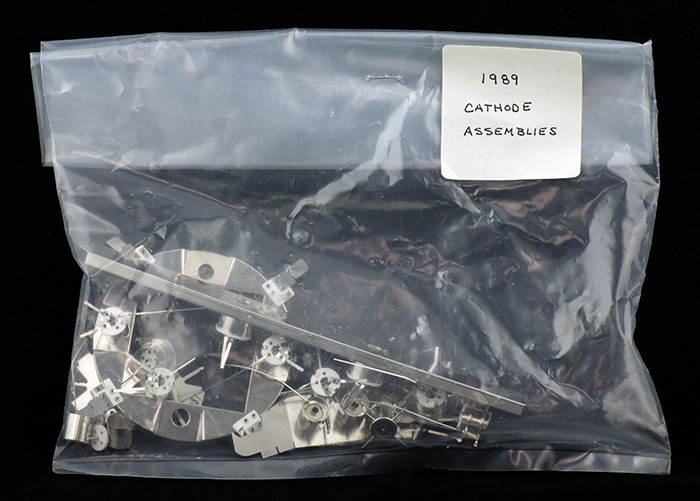 These are some of the last cathode assemblies built in 1989. This is the reading gun produced for the T7912 scan converter CRT. The CRT was used in the Tek Type 7912 digitizing oscilloscope capable of recording 2.5GHz signals. The product is unusual because the CRT is not visible due to the esoteric construction. 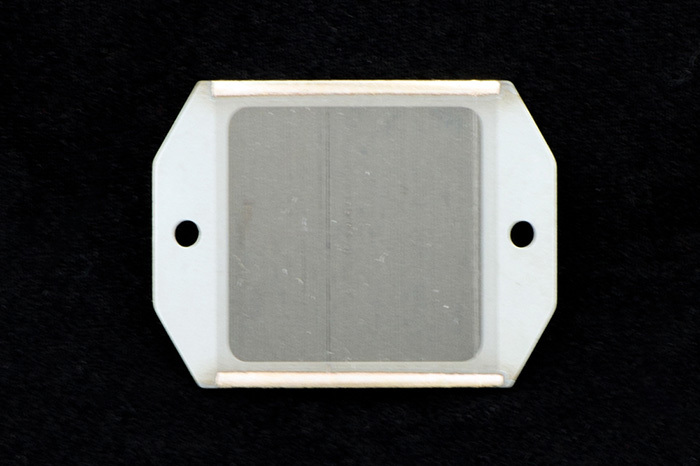 A high speed travelling wave deflection gun "writes" a small silicon wafer containing a 512 x 512 diode array and the waveform is "read" using the raster scan from the pictured gun on the backside of the wafer. The CRT has the appearance of some sort of mistake in assembly: the two guns were sealed opposing one another with the silicon target in between, rather than simply sealing a single gun to a funnel with a faceplate. 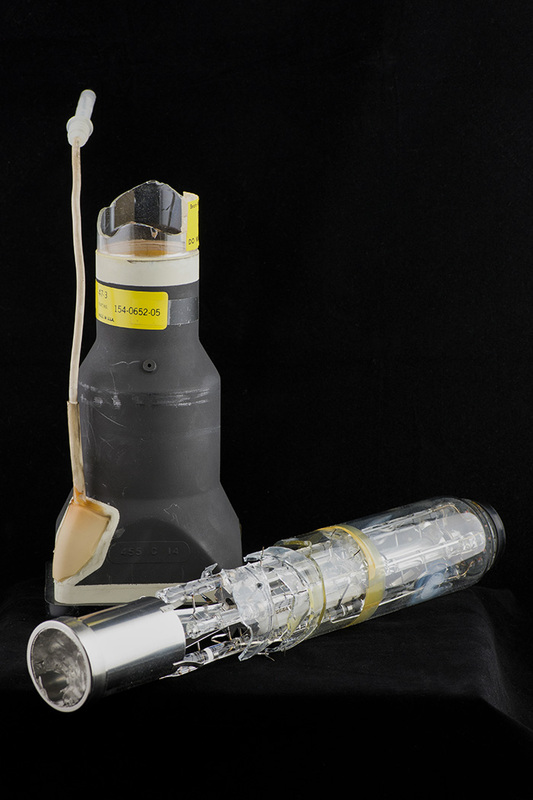 The 7912 was produced from 1973 to 1989 and primarily used for testing nuclear weapons, laser-based research and other high energy physics testing. During the numerous underground nuclear weapons tests in Nevada it was not uncommon to see entire tractor trailers loaded with 7912 scopes to record the 100 msec or less of data from the blast. Often the equipment did not survive. The price was $24,800 for a 7912 system in 1981. There is more information on our 7912AD Transient Waveform Digitizer page. 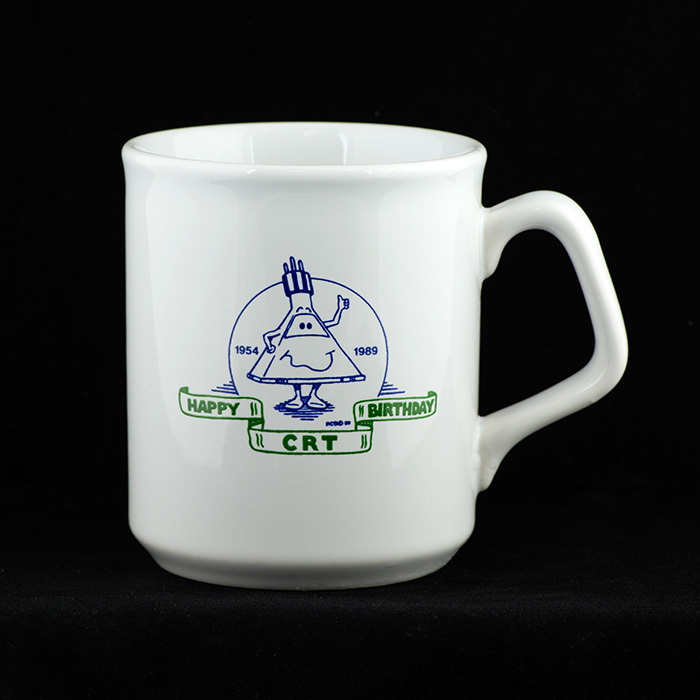 This is a decorative ceramic tile and a commemorative coffee mug celebrating the 35 anniversary of the CRT operation. Each employee was given a tile and coffee mug during the event. 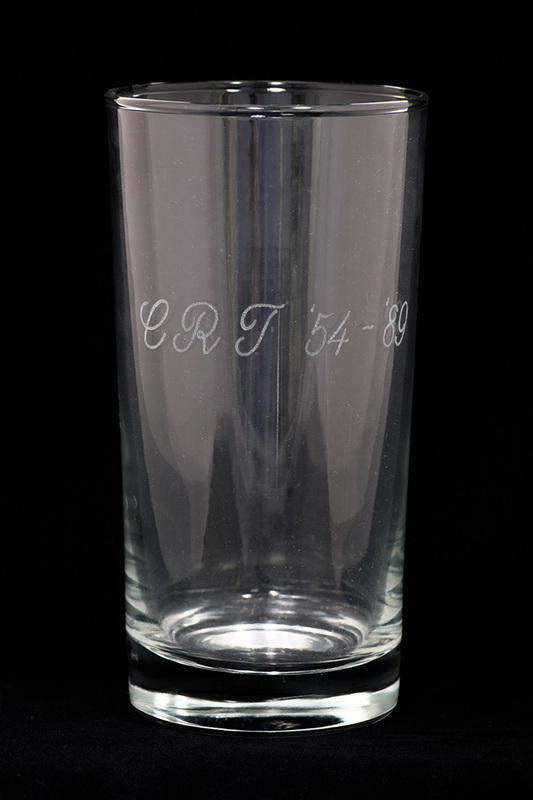 This is a commemorative drinking glass also celebrates the 35th anniversary of CRT but we don't know any more about it. 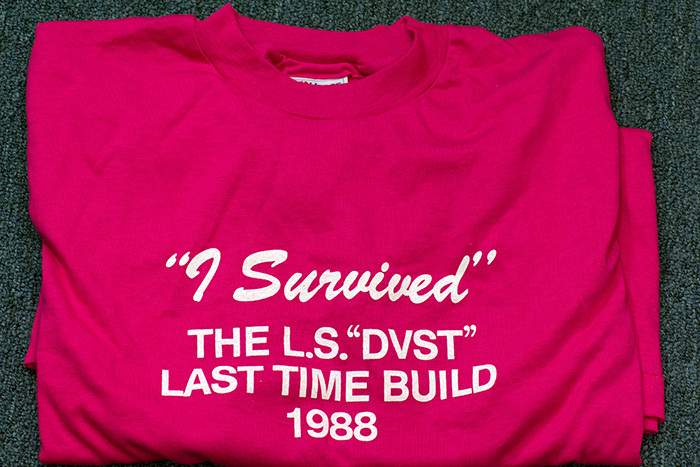 This shirt commemorated the shutdown of the large screen direct-view storage (DVST) tube CRT facility in Building 46. The manufacturing line produced 19” and 25” DVST CRTs used in Tek’s proprietary graphics products such as the 4014, 4016, 4054 and 4114. These products generated hundreds of millions of dollars in revenue per year from ~1974 to 1987. This January 6, 1989 TekWeek article describes the last DVST shipment from CRT. There is another TekWeek article on the Wilsonville page that describes shipping the last DVST product. 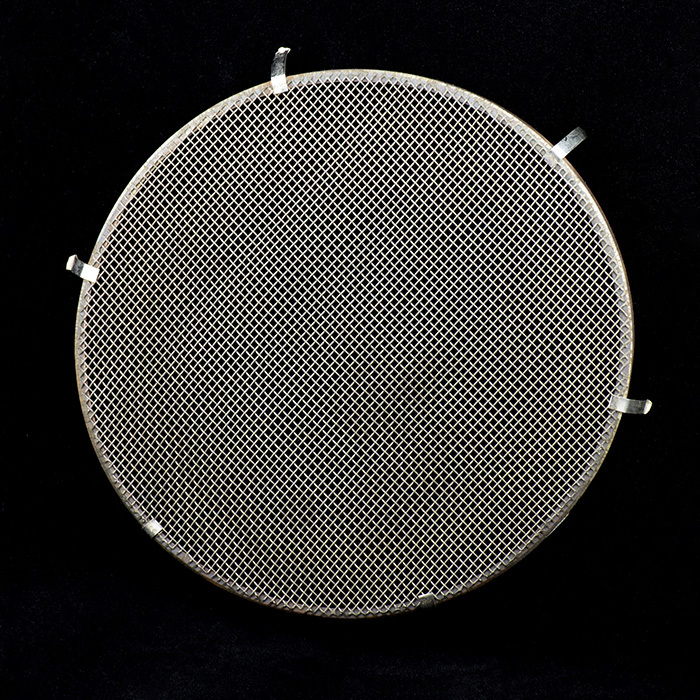 This scan expansion grid mesh was used to expand the horizontal scan in the T6470 CRT used in the 647A oscilloscope. The grid was formed by brazing fine tungsten wire around a beryllium nitride frame at a pitch of between 500 and 1000 lines per inch. With the transition from vacuum tube to transistor-based amplifiers there was a need to reduce the drive voltage required for the deflection plates. This could be accomplished using a one dimension scan expansion, as used in the T6470, or with a spherical, two dimensional mesh employed in later designs. The Type 647(A) and RM647(A) oscilloscopes were sold from 1963 to 1974. 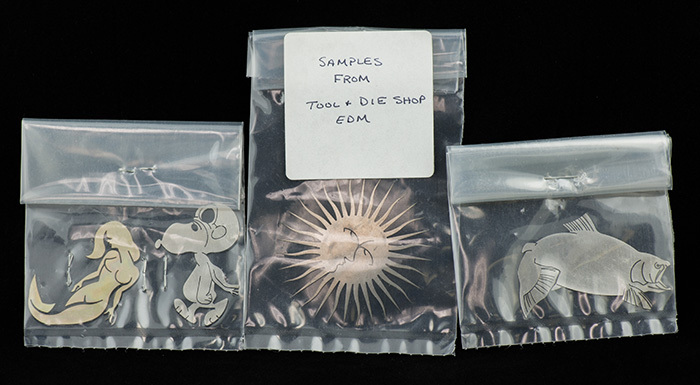 These parts were prepared to demonstrate the capabilities of the Electrical Discharge Machining (EDM) process. This is a “non-traditional” metal machining technique using high voltage applied to numerically controlled, opposed wire electrodes submerged in a dielectric liquid. EDM grew in popularity in the 1960’s as a means to pattern metal stock more rapidly and efficiently than conventional machining. It was used, for example, to fabricate steel electron gun fabrication tooling and the titanium avionics color CRT frit fixturing. 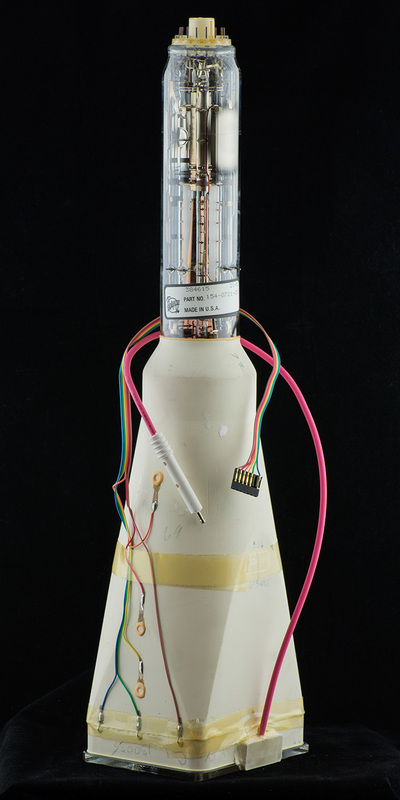 This bizarre-looking liquid crystal light valve (LCLV) CRT prototype was conceived by Duane Haven in Tek Labs in the early 1980's. The objective was to create a high resolution projection display component suitable for a wide range of applications. Various products were envisioned, including a computer aided design workstation, an all in one monochrome computer projector using an Apple computer (Mac In A Box) and a high definition, full color projector. 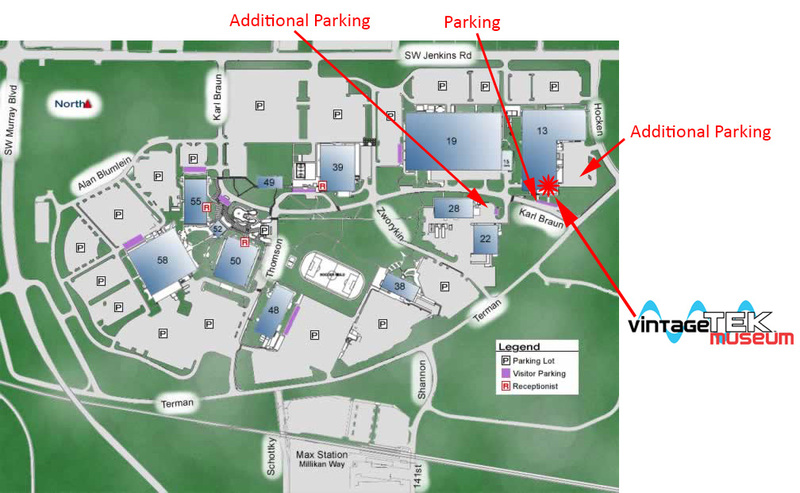 During the life of the LCLV development effort support came, at different times, from Tek Labs, the Tektronix TV Products group (two different periods) and the Eastman Kodak company. This work spanned the entire decade of the 1980s. Prototypes or proof of concept devices were built for all of these applications. 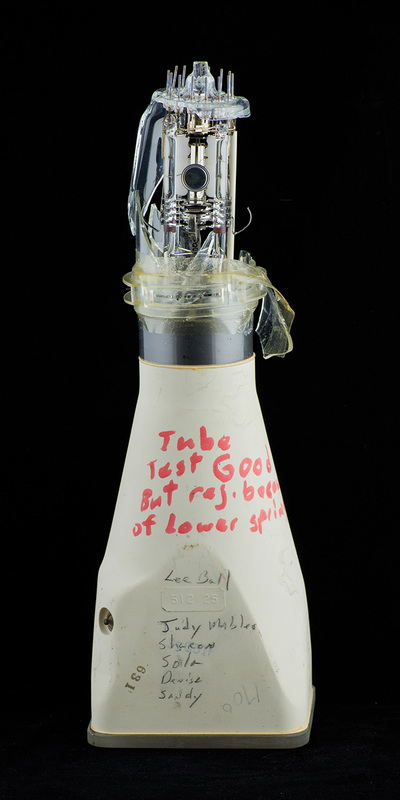 Tom Buzak dramatically improved the stability and life of this tube with a much-needed design revision at mid-decade. The two electron guns, one for writing and the other for erase, were used to create an image by scanning the backside of a six micron thick sheet of dielectric mica (a standard piece of paper is ~100 microns thick) constituting one side of a liquid crystal cell that was incorporated into the body of the CRT. A glass faceplate was used for the other side of the LC cell. When the writing gun raster is scanned across the mica a high transmission mesh located nearby is biased positive to collect secondary electrons. The resulting positive charge on the mica created an electric field across the cell that drove the liquid crystal material. The display was used optically in a transmission mode with a high intensity light source mounted between the guns and the projection optics located on the opposite side of the tube. While no product using this design was ever fielded, this CRT has probably the most innovative and adventurous creation of any Tektronix display. Who else would have come up with a design where a liquid crystal cell was scanned with an electron beam? This could only have been done at Tek. 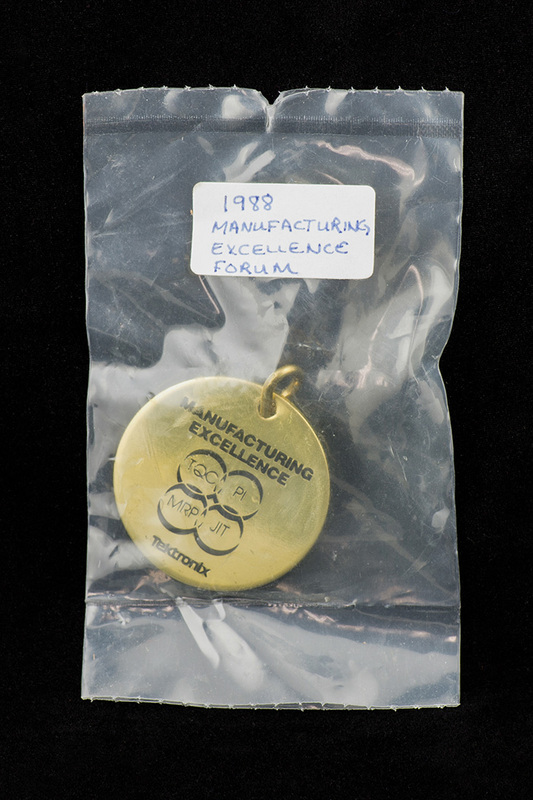 This is a medal from the Manufacturing Excellence Program that focused on operational improvements across the company. The four circles represent the integration of Total Quality Commitment, People Involvement, Manufacturing Resource Planning, and Just-In-Time manufacturing. Microchannel plates (MCP) were used in high speed T7707, T2467 & T7100 CRTs to amplify the electron flux near the screen to brighten an otherwise unobservably dim trace. 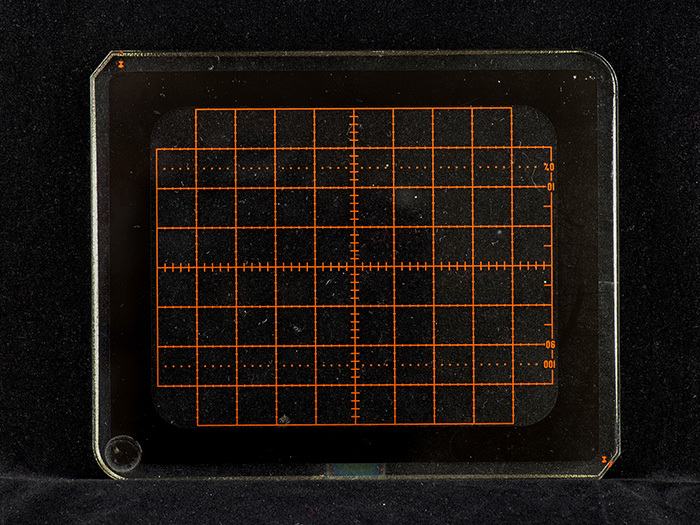 Also used in night vision goggles, a microchannel plate is a 0.050” thick slab of glass containing tiny (5 to 10 micron diameter) angled holes connecting one slab face to the other. When high voltage is applied across the plate each specially coated channel becomes an electron multiplier. Since the holes are positioned at an angle, the incoming electron beam in a CRT strikes the channel wall and this creates a cascading generation of secondary electrons that emerge on the opposite side. This increased density of electrons is then accelerated to the phosphor, creating a much brighter trace than a CRT lacking the MCP. The MCP offers at least a 100-fold increase in writing rate compared to a conventional CRT. This increased writing rate allows the user to observe events otherwise invisible with an ordinary CRT. Assembly of CRT electron guns requires extreme precision alignment of the various metal gun elements. Tabs attached to these gun components were locked in place by glass rods softened with a flame during assembly. 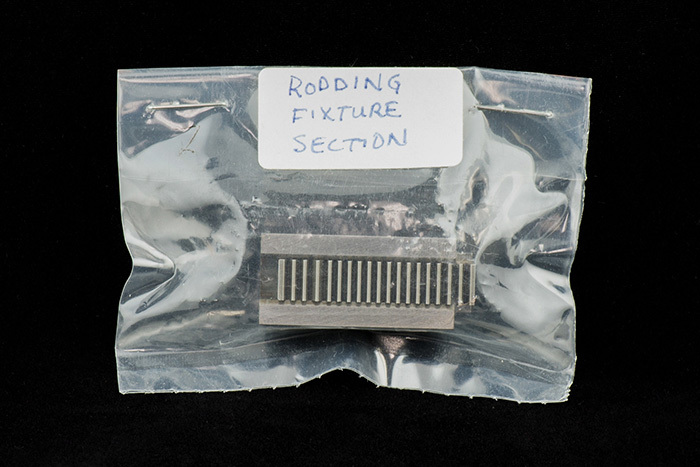 The rodding fixture held the gun parts precisely in place during this process high temperature. For the over forty years of Tektronix CRT production a small army of gun tooling designers and machinists plied their trade at the Sunset plant and later in the basement of Building 46/48. The picture shows a small section of a gun rodding tool. 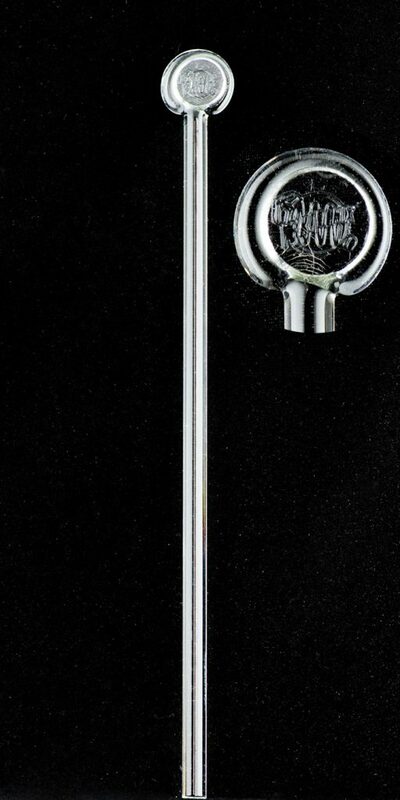 This Tek Logo Swizzle Stick was made from the same glass rod used to flame-seal electron gun parts in place. This is a T2140 CRT which was used in the Type 214 scope and had a bistable storage target. The 200 series oscilloscope CRT design was used in the 211, 212, 213, 214, 211, 222 and the 224 miniature oscilloscopes, produced from 1972 (Type 211) until the close of the CRT operation in 1996 (Type 224). 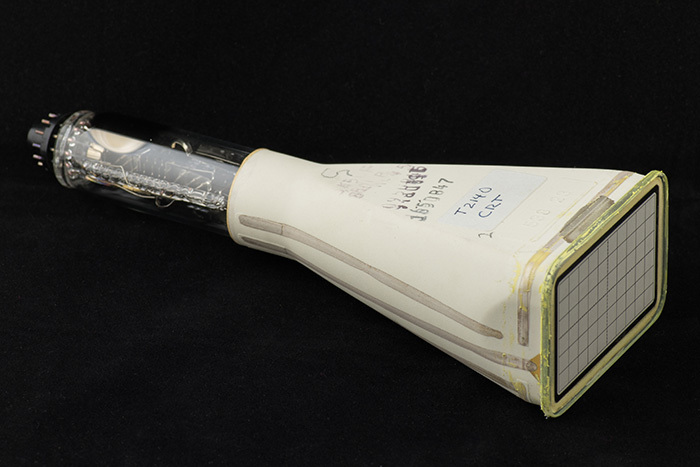 With a 2 inch diagonal screen, they were the smallest CRT ever produced at Tektronix. 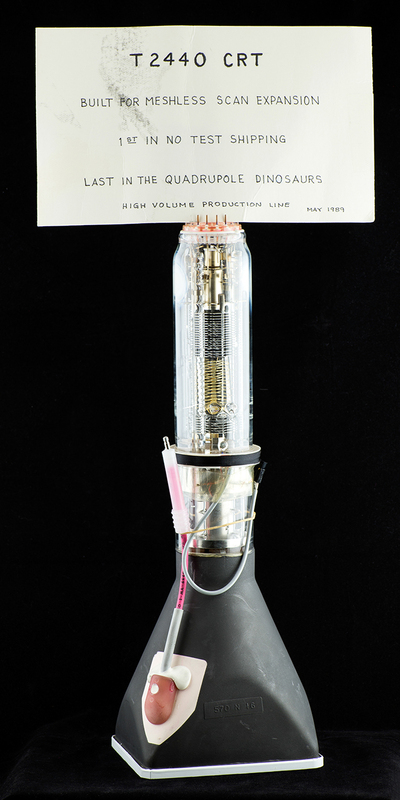 This is a T2440 CRT which was used in the Tektronix Type 2430, 2440, 2445 and 2465 oscilloscopes starting in 1984, providing up to 400 MHz bandwidth. The electron gun incorporates an innovative meshless scan expansion design that allows for a compact tube length and a smaller, brighter spot compared to prior mesh-based scan expansion guns. The performance was unmatched by any competitor. A proprietary quadrupole lens design provided these characteristics. 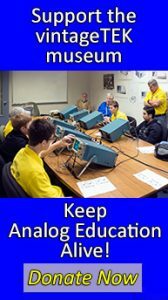 The 1st in no-test shipping refers to an improvement in the process where CRT burn-in during manufacturing was eliminated and moved to sample testing since the instruments were burned-in during final production. The scopes using this gun succeeded the highly successful Tek Type 465 product. Price for a base 2465 was $5850 in 1989. Also included was the gun assembly for the T2440 CRT showing the intricate structure. This is a T7630 sophisticated storage CRT with three meshes and a bistable storage target capable of functioning with the full complement of storage modes: normal and fast bistable as well as normal and fast variable persistence. The CRT has an analog bandwidth of 400 MHz. 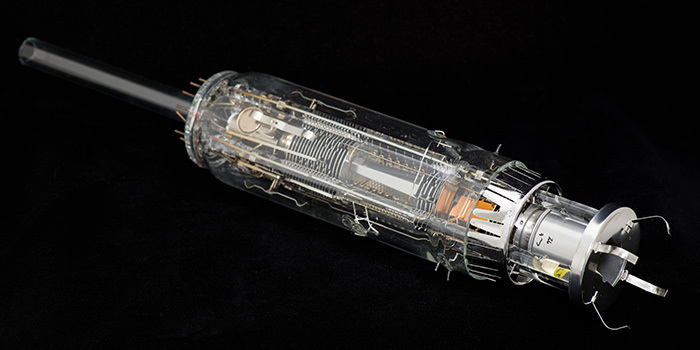 This tube was used in the Tektronix Type 7623 and 7633 oscilloscopes manufactured from 1975 to 1990. It was succeeded by the still faster Type 7834 and ultimately, the Type 7934, at 500 MHz the fastest storage CRT and scope ever produced.